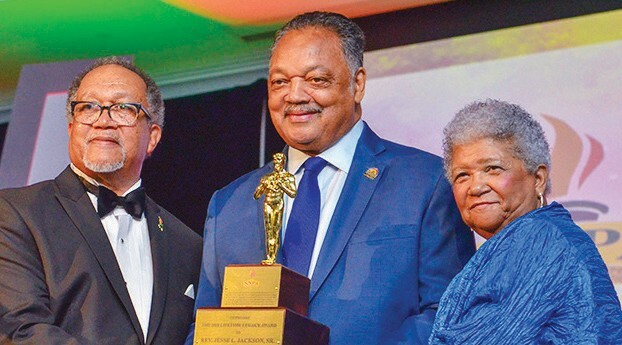 Reverend Jesse Jackson, Sr. accepts the 2018 NNPA Lifetime Legacy Award. “This honor takes on a special meaning for me because my first job was selling the ‘Norfolk Journal and Guide’ newspaper and then the ‘Baltimore AFRO American’ and then the ‘Pittsburgh Courier,’” Jackson said of the iconic Blackowned newspapers. During the General Motors-sponsored ceremony, Leavell and Chavis said Jackson has carried King’s legacy well. Leavell recalled Jackson’s historic run for the presidency in 1984 in a campaign that registered more than 1 million new voters and catapulting Democrats in their successful effort to regain control of the Senate. In 1984, Jackson secured the release of captured Navy Lt. Robert Goodman from Syria, and he also help shepherd the release of 48 Cuban and Cuban American prisoners in Cuba. Jackson said President Trump should and can be defeated, with the aid of the Black Press, who this year has led a drive to register 5 million new African American voters.